Yesterday we announced the Gold, Silver and Bronze Stevie Award winners in this year's (10th annual) International Business Awards, the world's top honors for achievements in the workplace. See the full list of winners here. Today we've opened voting for the People's Choice Stevie Awards for Favorite Companies, a feature of the IBAs in which the general public worldwide can vote for their favorite companies and other organizations in 17 categories. Voting is now open at http://peopleschoice.stevieawards.com. Voting concludes on September 13, and the top vote-getter in each category will receive a special crystal People's Choice Stevie Award at the IBA's 10th annual awards gala on October 14 at the W Hotel in Barcelona. Anyone can vote one time in any or all of the 17 categories. 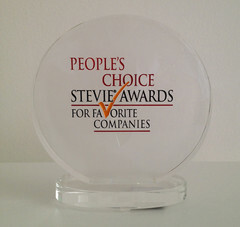 More than 211,000 votes were cast in the 2013 People's Choice Stevie® Awards for Favorite Customer Service, part of the 7th annual Stevie Awards for Sales & Customer Service, the world's top business awards for contact center, customer service, business development, and sales professionals. - Computer Software: Cvent, Inc.
- All Other Industries: Vivint, Inc. The crystal people's choice awards will be presented to winners at the Stevie Awards for Sales & Customer Service seventh-annual awards banquet on Monday, February 25 at the Paris Hotel in Las Vegas, Nevada. Tickets for the event are now on sale. More than 300 executives from around the world are expected to attend. Voting for the 4th edition of the People's Choice Stevie® Awards for Favorite Customer Service, has been extended through 11:59 pm ET on Sunday, February 10. Vote for your favorite provider of customer service here. 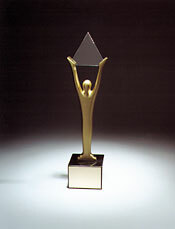 Organizations will have the opportunity to win two awards: a Gold, Silver, or Bronze Stevie Award, as determined by professionals on the sales awards, customer service awards, and contact center awards peer-review judging committees, and a crystal People's Choice Stevie Award, as determined by the public vote. Winners of the crystal People's Choice Stevie Awards will be celebrated at an awards gala at the Paris Hotel, Las Vegas, Nevada, USA, on February 25, 2013. Leave us a comment and tell us about your favorite provider of customer service!